New Year’s Eve is the perfect time to play some fun games together. Here are 15 fun ideas for activities to play with your friends and family! 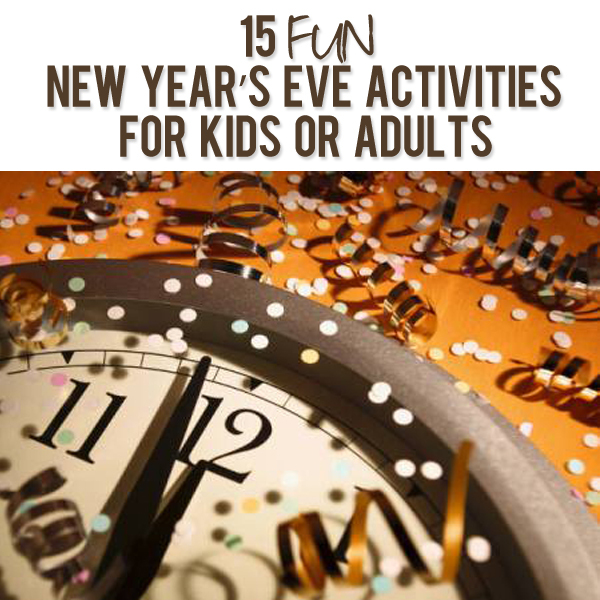 These New Year’s Eve activities are great for kids or adults. Make each of your guests write down resolutions, each on its own slip of paper. Pull one slip of paper out of a basket at a time and read it out loud. Everyone has to write down who they think made each resolution. At the end of the readings, the person who guessed the most correctly wins a prize. Read some of the wrong guesses out loud for fun! Have everyone tell the group 2 of their real resolutions and 1 fake resolution. Everyone has to guess which is the fake resolution. Write a bunch of different words on a piece of paper that have to do with New Year’s Eve and scramble the letters. The person who guesses the most words correctly wins a prize. Write down 100 words on index cards such as stare, grin, blink, giggle, laugh, plate, shoelace, thread or any word you like. Stack the cards and put them in the center of the room. Divide the players into 2 teams and seat them opposite each other. Set the timer or stopwatch for one minute. Have the first player from Team One draw a card from the pile and give clues to the word to his/her teammates before the timer ends the play. Team One try to guess the word; if they are successful before the time is up, they get a point. If the timer runs out and the word is not guessed, the other team gets a bonus point. Take turns until all the cards are exhausted, and then add up points to see who wins. Take the picture of each of your guests with the digital camera. Have them make a funny face and be sure to tell them there is a prize for the best face. After all the pictures have been taken, download them to your computer or laptop and ask everyone to gather around the monitor. The winner will be judged on the greatest laughter. Everyone writes the name of a celebrity, famous person or character on a piece of paper and then they stick to the forehead of the player on their left (use tape or office Post-It notes). Make sure they don’t see the name. Now the game starts. Everyone else can see your forehead. The objective is to work out who you are. Going around the table, each payer takes a turn to ask the party questions about who they are – answers can be YES or NO only. If you get a YES you may continue asking, if you get a NO play moves on to the left. Last person to guess their name is the loser. For this, you need about 6 different candies that have given names like M&M’s, Crunch, Wrigley’s, etc. 1 Die (or 2 dice if the crowd is very large). Everyone is seated on the floor in a circle. Packaged candy bars or candy are placed in the middle of the circle. The game starts with everyone saying their own name. If you already know each other, make up an animal name or famous person name or something to make it harder. The leader then makes sure that everyone knows what candy is in the middle. Someone begins by rolling the dice. If they roll a 6, they can take one of the candies in the middle. The die continues to go quickly around the circle while people keep picking up candy. When all of the candies are taken, people can then get other people’s candy. In order to get their candy, they must state the person’s first name and the name of the candy they hold. The person who rolls a 6 and matches the name of the candy and the person takes the other’s candy. If they forget either name, they miss their turn and the dice go to the next person and they continue to roll. (One person can get more than one candy and people can hide the candy behind their back). This is a great way of getting to know people’s name and how to get your favorite candies! The kids will have a blast following the clues to get their treasure. If it is warm where you live, send them outside for parts of it. Put anything you want to remember along with your resolutions in a container and then hide it till next year. The players try to win as many yarn necklaces as they can. He/she who has the most at the end wins a prize. Give each player a necklace. The idea is to get the other players to say “No”. Try to make your friends say, “No”. If your friend says it, then you get their necklace. This game is played during the entire party. Whoever creates the most words out of the letters in Happy New Year, wins! Fill a clear glass or plastic jar (with a secure lid) with a known quantity (yes, you have to count them!) of candy, marbles, pennies, tiny toy cars or some other item that ties in with the theme of your party. Decorate the jar and lid with stickers and a bow and place on the arrival activity table. Provide slips of paper for guests to write their names and their “guess” and a small basket or box to collect the entries. At the end of the party award the jar of goodies to the child with the closest guess. Some ideas: a party hat, streamers, noisemakers, plastic champagne glass, a clock, Happy New Year card, Happy New Year balloon, drink stirrers, coasters, chocolate coins, a calendar, or silver bells to ring in the New Year. 14. Match the country with how they say, “Happy New Year”. A free printable game from HowDoesShe – This is suited more for older kids or adults. Party Supply Hut has more fun printable games for your New Year’s Eve activities. 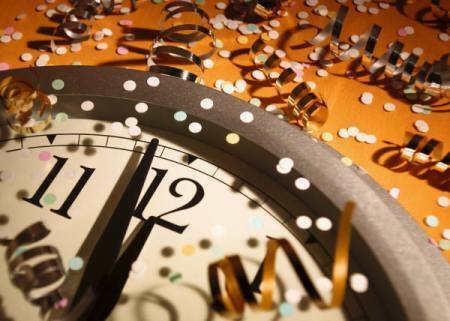 What are your favorite New Year’s Eve games and activities? Or maybe you’re putting the kids to bed and celebrating with the other grown-ups in your life. We’ve got ideas for that, too! « Welcome to the U.S. Kinder Joy! Love these ideas.. there are more fun family New Year’s Eve party ideas at Celebration Ideas Online at wwww.celebrationideasonline.com. Free printable New Year’s Bingo and Holiday Trivia games.. great ideas for family fun at your New Year’s Eve celebration, including activities and family entertainment. LOVE these ideas! We’re having relatives over, ages range from 2-45. I think these will definitely help us have lots of F.U.N.! Let’s try these games out for New Year’s Eve! What fun! Speaking of treasure hunts, our family likes using Riddle Me software which is super easy to use. You just select an age and your options and print out the clues and tape them up and the hunt is ready to go. My kids love it. So fun! Have a great New Year! I am so playing some of these games tonight at my party!!! Thanks for the fun ideas! My family and I did a time capsule 10 years ago, when my children were 12 and 6. Tomorrow night we are getting together to open it. I can’t wait to see what we had put in it. Great ideas!! I love this site and can’t wait to see what you have in store for all of us in 2011!! You girls rock. Blessing to all of you and your families. Awesome ideas! It’s just so darn hard to think of things yourself – hurray for “How Does She” and their awesome lists and ideas! Woo! I’m going to try this tomorrow night at the party I am throwing! Thanks for always having such fun ideas! I love these party ideas .I will try few for new year eve. You guys should make your own fun facts! Instead of using other websites, use your brain that God gave you to make ideas with! Oh we always post our original content on our blog, on almost a daily basis. This is just a fun round up of other ideas so we can have them at an easy to access place, sort of like pinterest. Thanks for being here! Nice activities. Thanks for sharing.